Back to School with Ready and Waiting for You! 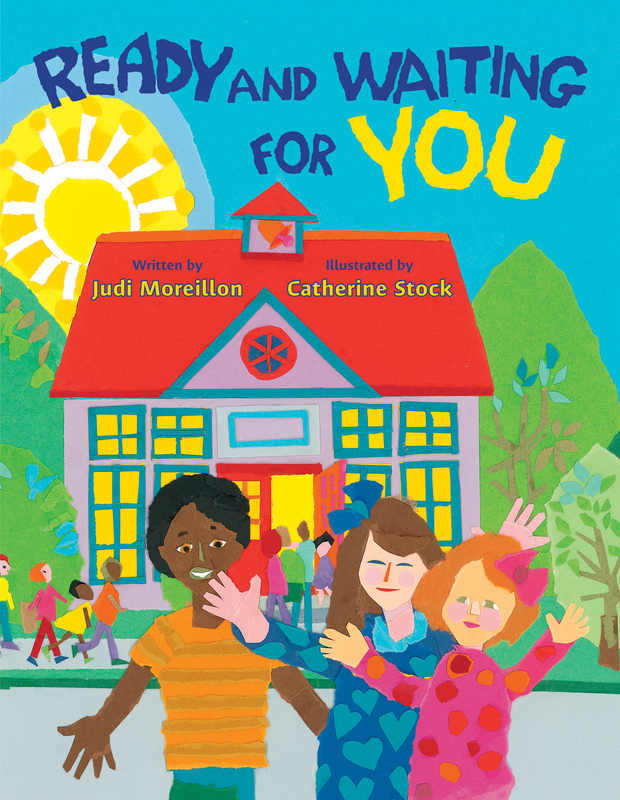 Judi Moreillon is a librarian educator and the author of several books for children, including the new picture book Ready and Waiting for You. I love the title of our new children’s picture book. Shouldn’t every child who is starting school or changing to a new school hear those words of welcome? Illustrator Catherine Stock and I surely think so! From the school bus door through the front door of the school, to the office, library, cafeteria, playground, and finally the classroom door, young children who read our book are invited to enter and interact with a school that is “ready and waiting” just for them. Starting school is an important rite of passage for young children. Even if they have attended preschool, achieving “big kid” status and going to a “real” school is an exciting and sometimes scary time for five- and six-year-olds. I was one of those children who was frightened by the prospect. While other children looked forward to kindergarten, I grew more and more anxious about leaving the safe routine of home to start school. My mother, with my 1-year-old sister in the stroller and my 3-year-old brother in tow, walked me eight blocks to kindergarten in the rain or shine — and in the snow, too. My first elementary school was a huge building, three stories tall with a stone façade. (I recently visited it and was surprised that my memory of its imposing presence was not at all exaggerated!) My kindergarten teacher was not warm and welcoming either. She was stern and required students to stand up or in front of the class to speak. I was terminally shy, and her requirements took me way beyond my comfort zone. Still, I somehow survived my early school years, grew up, and became a teacher and a school librarian. Some people become educators because they had wonderful school experiences. Others — including me — become educators because they want to give children the positive experiences they never had. I have now spent most of my adult life in schools and universities as a student or an educator. I have experienced the power of learning to open doors and create possibilities for young people and adults alike. Our book Ready and Waiting for You celebrates the community of school. Artist Catherine Stock has used torn paper in bright, bold colors to convey the excitement of being welcomed to school by a caring and ethnically diverse cast of children and adults. When I first saw Catherine’s illustrations, I immediately noticed — and loved — the way her characters greet each other with open hands and outstretched arms. While our book was written for children, it will doubtless be read by many adults, too. I hope it will remind adult readers that there is an entire community that works in collaboration to create an appropriate learning environment for children. A fully-staffed school will have a librarian, a gym teacher, an art teacher, and a music teacher, too! Sadly, though, many children today do not have a complete elementary school faculty who work together to help them develop their whole beings — hearts, minds, and bodies, too . . .
Could it be that some adults have forgotten (or do not realize) the impact schooling has on children’s social and emotional as well as intellectual lives? In the media, educators are often blamed for consequences of societal ills over which they have no control. In the real world of school, the vast majority of teachers arrive early at their classrooms every school morning, smiles on their faces, ready to greet the children who rely on them to make the world of school a safe and exciting place to learn. Educators are dedicated, caring people who open doors that, for many children, would otherwise remain closed. Click to order Judi Moreillon and Catherine Stock’s Ready and Waiting for You or to visit Judi Moreillon’s website.